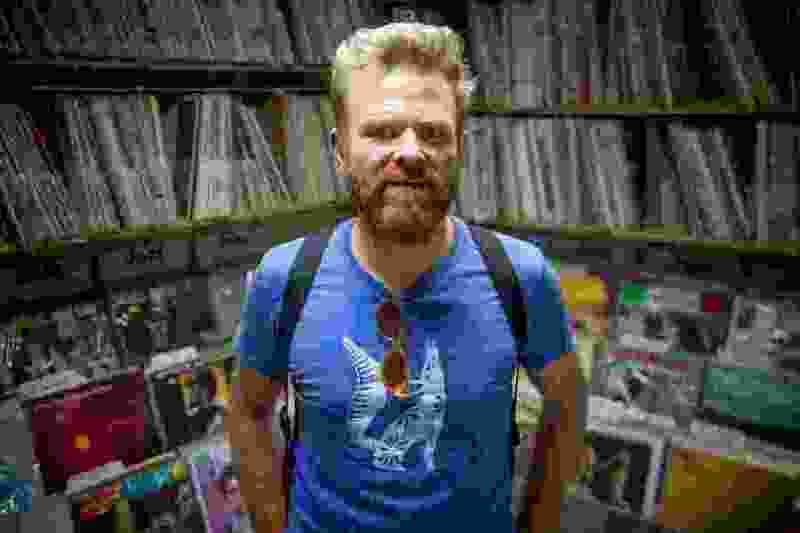 (Jeremy Harmon | The Salt Lake Tribune) Samuel Stinson of Randy's Records is one of the organizers of The Great Salt Lake Record Sale at Urban Arts Gallery in Salt Lake City on Sat. Mar. 23 and Sun. Mar. 24. Samuel Stinson grew up surrounded by vinyl. There was his dad’s Salt Lake City record store — Randy’s Records, founded by Randy Stinson. There was the room inside the store that he and his siblings used as a hangout. And there was the locked basement at home that held his father’s most valuable and rare records. “I snuck in there a few times,” he admitted. Today, as Stinson takes over the store from his father, who retired earlier this year, he wants to help Utahns find records beyond those on his shelves. For years, he had talked with Brad Wheeler, former KRCL radio host, now a KUAA DJ, about putting together a big record sale in Salt Lake City, inviting vendors to bring their treasures from other states. “That’s the big hook for the collector: What’s going to be in this pile of records? You never know what you’re going to find,” said Wheeler, who collects vinyl and recordings in other formats. Now the Great Salt Lake Record Sale is scheduled from noon to 6 p.m. on Saturday and Sunday at the Urban Arts Gallery in The Gateway. The Salt Lake City show will feature at least a dozen vendors, including independent sellers from Montana, Idaho, Wyoming and as far away as Alabama. Planning for the show got underway after Matt Donovan, a vinyl collector and seller from Jackson Hole, Wyo., approached Stinson. For Donovan, the closest record stores are either a four-hour drive to Bozeman or five-hour drive to Salt Lake City. He said he attends similar record sales in Idaho and Montana, and puts on his own pop-up record events in Jackson Hole, but hasn’t heard of one quite like this in Utah. “Part of the reason for doing this record sale is to provide access to people in Utah and the surrounding region to records that wouldn’t otherwise be available here,” he said. In addition to Randy’s Records, the two other Utah stores that will participate are Lavender Records in Ogden and Graywhale, which has stores in Taylorsville, Sandy and Ogden. Organizers expect to have thousands of records available, with offerings from three-for-$5 bargain records to $100 individually priced records, as well as all genres, from classic rock to country. Not a classical music fan? Utah Symphony is ditching the ‘unwritten rules’ to make you feel welcome. Admission will be $10 for the first two hours on Saturday — from noon until 2 p.m — for the opportunity for early birds to scour the collections. Entrance will be $5 after that, and $5 on Sunday, cash only. The fees have sparked criticism on Facebook, where the event was initially listed as free. While organizers have blamed Facebook for the mistake, commenters noted the event also was described as free elsewhere. His goal is to get records off store shelves, out of basements and garages and onto turntables, he said. Records “are meant to create memories and make people happy,” Stinson said. Barbarella Roller, an audiophile and avid collector, is looking forward to this weekend’s sale, hoping to find something obscure she can add to her inventory. ( Julie Hirschi | For The Salt Lake Tribune ) Barbarella Roller is an artist, farmer and avid record collector from Salt Lake City. “It’s a fun way to connect with people, having them over to just listen to records," she said. “There is nothing like going to a record sale and digging and digging and then all of the sudden finding that record that you’ve been looking for. It is the thrill of the hunt,” said Roller, a Salt Lake City-based artist and farmer. Roller said she first became interested in records as a child but didn’t start collecting seriously until college. She’s always on the lookout for records that she had as a kid, such as the score of the musical “Annie.” That was her first cherished record, and is pretty scratched up from being endlessly played. “I actually played it until it didn’t work anymore,” she said. Record collecting is “for anybody who likes music, which is everyone,” Roller said in her home as she carefully pulled out a luminescent green vinyl from its pristine sleeve, put it onto a turntable and adjusted the needle. Sale organizers expect to have thousands of records, from all genres, available from more than a dozen vendors. Where • Urban Arts Gallery, run by the Utah Arts Alliance in The Gateway at 116 S Rio Grande Street, Salt Lake City. Tickets • Admission will be $10 for the first two hours on Saturday (from noon until 2 p.m) then $5 for the rest of the weekend, cash only. For more information, visit Great Salt Lake Record Sale on Facebook or call 970-420-7762. This coverage of downtown Salt Lake City arts groups is supported by a grant from The Blocks, a cultural initiative of Salt Lake City and Salt Lake County. The Salt Lake Tribune makes all editorial decisions.